I was working in the bedroom the night before I flew to Austin. Nothing on the bed except me, with a laptop in my lap. So relaxing. 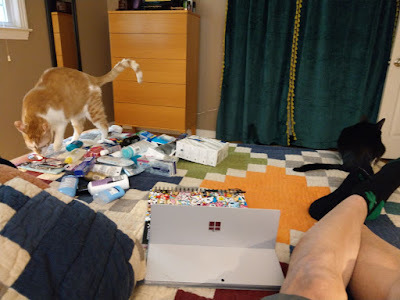 To summarize: both cats, fifty unneeded toiletry items, and a wife. "This seems to be somewhat less productive than literally a minute ago," I said. Of note: we've played so much tennis in the last few weeks that I no longer look like a thin polar bear, as you can see from my legs. Also of note: Eli 16.11 still can't beat me, but I'm holding on for dear life.